Adjust: establishing an exact magnitude of measurement in a device by technically intervening with the measurement system. Or: Regulation of a meter up to the smallest deviation of the true value. Accuracy: Display of the maximum and minimum deviation of the nominal value. Actuators: An actuator is an element which is contrary to the sensor. This is an active mechanical element and it is normally used as a loop actuator. Calibration certificate: document containing the technical characteristics of our meters, which are traceable to a national standard. This means that the user is in charge of checking and controling the interval between calibrations. We recommend that this interval between calibrations should be between 1 and 3 years. Certificate of conformity: A verification certificate which is issued by the Verification Centre. Certification according to DIN EN ISO 9001: the certification shows that a company meets with all the required quality management system according to DIN EN ISO 9001 standards. After speaking with the appropriate authorities, a certificate can be obtained according to the quality management system standard DIN EN ISO 9001. Certificate of inspection: Manufacturer’s certification which confirms that the instruments meet all the technical specifications (technical sheet). Control and measuring instruments: they cover all the meters, visual display units and references that are used in the development and manufacture of a product for purposes of measuring qualitative relevance. (Manufacturers of meters). Declaration of conformity: the declaration of conformity documents that a product corresponds with EU directives. Digital interfaces: For the connection to a PC or to a meter (SPS). It allows to transfer measurement values in digital form for further analysis or to set meters through the PC. Some examples are RS485, RS232, Profibus DP. Display: It displays physical, chemical and biological quantities. Display range: Maximum and minimum values which can be displayed. Factory certification: Manufacturer’s certification which confirms that the instrument meet all the technical specifications (technical sheet). Factory calibration certificate: Factory calibration certificates are issued with standards which are subject to a regular control or the calibration instruments. Meters are adjusted through control and calibration devices. Indication of an overload: shown on the display of meters (OL) when a minimum or maximum load is exceeded. This overload can damage meters. 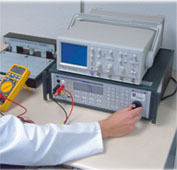 Interface: Connection port to connect meters to a computer for measurement values to be transferred. ISO 9000: Quality control system (DIN) for quality controls in the company. Ingress protection (ip): the higher the number, the better protection against dust and water that the meter's enclosure has. IP 54 is standard. LCD display (liquid crystal display): term used to identify a type of display which incorporates liquid crystal and is not illuminated on its own. Logical zero: Both current and voltage signals in control systems in which the lowest value is not equal to zero but they have a logical zero. A well known example is the 4-20 mA signal. When transferring this signal, it should not occur below 4 mA. A signal with logical zero has two advantages: On one hand, it can detect and show an error, and on the other hand the sensor can use the signal as a power source. Loop system: The control of an input signal, which by means of a response can close one circuit, is called loop system. Measurement deviation: Deviation of the displayed value in relation to the real measurement value. 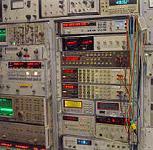 Measurement rate: Number of measurements which a device performs in a precise time interval. Measurement uncertainty: It indicates the range in which the real measured value is. Measurement range: Range used by meters. When both upper and lower limits are exceeded there is measurement values. Over oscillation: A sudden change of the input signal which always brings that the back regulation exceeds the output signal before reaching the desired value. This process is called over oscillation. Profibus DP: For the control and consultation of sensors and actuators. RS-232 interface: refer to “Connection port”. Repeatability: (standard deviation) the coincidence of repeated measurements under the same conditions. Resolution: The smallest separation in the magnitude that the meter can detect, it is also known as digit. Regulator: Unit which controls an input signal which depends on an output signal. Response time: Time interval from the moment a magnitude is connected to a meter to the moment in which this value is displayed. Response time: It is the time that a controller needs to introduce the output magnitude inside the established magnitude. Scale: The conversion of a standard signal in a physical quantity is known as scale. Signal converters: Unit for the conversion of physical, chemical or biological quantities into a standard electrical signal. Standard signal: Standard electrical signal in the control systems for the transference of physical, chemical or biological measurement values, i.e. 4-20 mA. Sensors: Unit for the conversion of physical, chemical or biological quantities in an electrical magnitude to be detected by electronic regulators. Thermal influence: This is physically tied and it can only be corrected by means of incorporated compensations. Some meters have an automatic temperature compensation, others a mechanic one. The mechanic compensation shows the current temperature, for instance, by means of an adjusting wheel or a display. Traceability: This concept describes a process through a measured value can be compared to the national standard of the magnitude. Thanks to the contract with the “CEM” and the DIN EN 45001 standard, it is not necessary to show the retrievability. 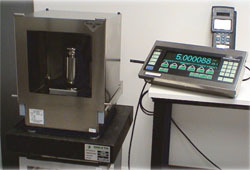 Tolerance of a measuring device: each device has an indicated tolerance to physical conditions. tolerance defines the most deviation allowed. Totalizer: This functions allows for the integration of the measurement values through time. The information presented here may not be complete or exact. It is provided simply as a guide in realtion to measuring equipment. 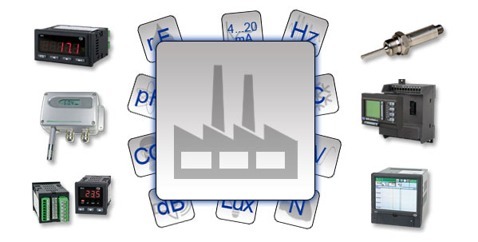 The pages within the domain www.industrial-needs.com are property of PCE Holding (©), Germany. The pressure sensor PCE-DMM 50 is suitable for stationary and mobile pressure measurement. The pressure sensor PCE-DMM 50 is used in mechanical and plant engineering, laboratory technology and environmental technology. This pressure sensor is battery powered. The measuring range of the pressure sensor reaches up to 600 bar. The pressure sensor PCE-DMM 51 is suitable for flush mounting hygiene. Thus, the sensor can be installed both in the food industry as well as in medical technology. The pressure gauge shows on its rotatable display pressures up to 400 bar, relative or absolute. The operating fluid of the pressure sensor has a food safe FDA approval. The pressure sensor PCE-DMM 21 is suitable for flush sanitary installation. The pressure sensor may represent on its rotatable display pressures up to 40 bar, absolute or relative. The filling of the pressure sensor has a food safe FDA approval. The flush mounting of the pressure sensor can be sterilized. The pressure sensor PCE-DMM 60 is a precision instrument of the highest standards. The pressure sensor is specifically designed for process monitoring and calibration. This pressure sensor is distinguished by its modular concept. This means that the actual sensor and the display can be separated. The pressure transmitter can be selected on site for different measuring ranges and connected to the display without tools.